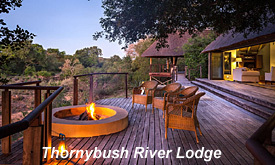 Situated within 14 000 hectares of pristine wilderness, adjacent to the Kruger National Park, the Thornybush Nature Reserve is a true escape from the madness of city life. This haven, which is just over 5 hours’ drive from Johannesburg has scooped numerous world firsts, both for conservation and hospitality. Thornybush has evolved over the years into a visitor’s paradise.. Each Lodge has been carefully selected to provide a variety of differing experiences and designed to meet the varying pockets of discerning travellers. 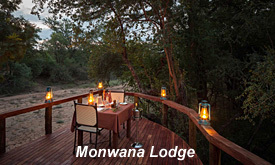 Serondella, nKaya, Waterbuck and Monwana are four small intimate lodges that each accommodates eight people in a unique environment, each with their own personal intimacy of space, comfort and warmth. Each of these Camps with a sparkling swimming pool, Bar and differing Dining venues to suit the season and the occasion. Jackalberry lodge caters for just 16 guests at a time, in 5 classic safari chalets, 1 honeymoon and 1 family suite. 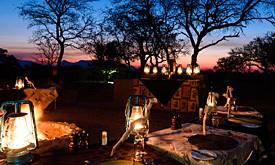 All the accommodation overflows with ethnic ambience, and blends into the surrounding vegetation, for an intimate experience in harmony with the rhythms of the African bush. 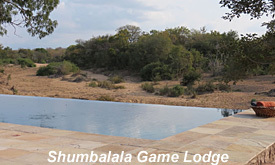 Shumbalala, an exquisite five star property with every possible comfort and privacy, is both spacious and stylish and offers guests the ultimate in personalized hospitality. This Camp boasts an exceptional Presidential Suite with adjoining entertainment area exclusive to this suite which includes two bedrooms, Lounge and Dining room and central open fireplace. A feature wine cellar is unique to this special property. 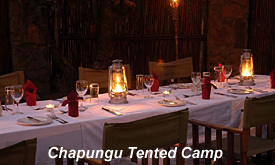 Chapungu, that accommodates 16 guests in Africa’s flavour of the lowveld comfort. 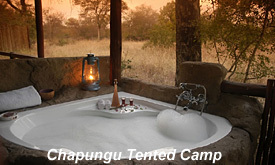 This Camp too has a central swimming pool, Bar and each tent with private facilities and feature outside bath. 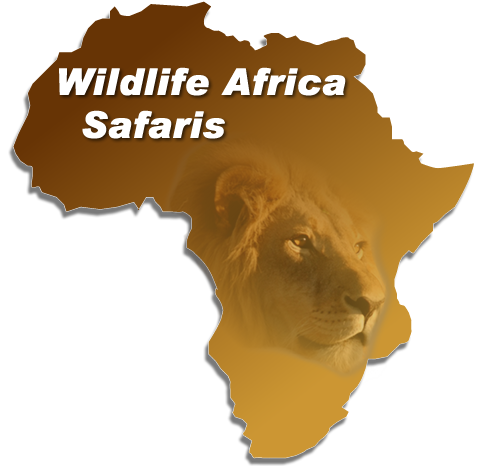 Nkelenga Self Catering Camp, is situated close to a small dam that is home to thirst quenching animals at dawn and dusk. This Camp also has a small private swimming pool, three tents with private facilities, a main homestead with a further bedroom and small mezzanine “dormitory” that sleeps four, designed for children of all ages. 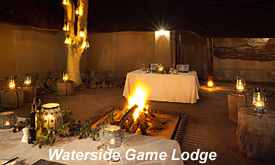 This Camp sleeps a maximum of twelve and is particularly attractive to budget conscious game enthusiasts. This Camp is the only camp in the collection that has a Camp rate per night rather than a per person rate per night.